To, okay, it’s real, but what’s the big deal? But, let’s start back at the beginning. For the past week or so, I’ve been seeing postings pop up in one LinkedIn discussion group after another, proudly proclaiming their Top 1% (or 5%) Most Viewed Profile status. Surely you have too. While my skeptical side was on high alert, turns out, the designation is authentic. And while it is quite an achievement for LinkedIn, the company, to have reached 200 million users, as a personal achievement the 1% most viewed designation is a bit less impressive. 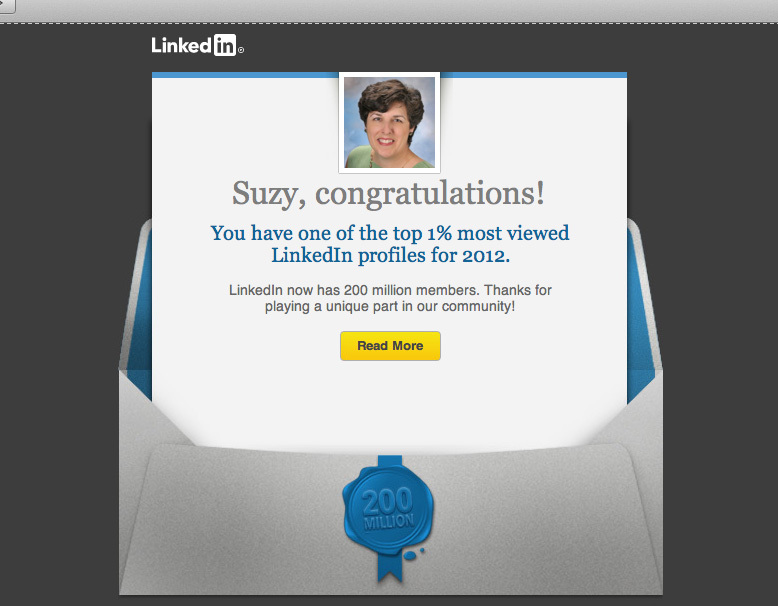 Do the math and you’ll soon realize that 1% of 200 million means 2 million other LinkedIn users also got the same Most Viewed Profile designation that I did. And 10 million people made it into the top 5%. Not such an impressive personal achievement after all, if you ask me. So, it got me to wondering, what’s the point? And then it hit me. The LinkedIn promo is actually a really very clever marketing campaign designed to increase word of mouth discussion – at water coolers, on discussion boards and various social media sites – which in turn, drives even more page viewership and site usage. And, incidentally, is it pure coincidence that the timing of these announcements just happens to occur right around the release of their stock’s earnings statement? I doubt it. Very clever indeed. But what LinkedIn has done is even more clever on several fronts. First, it attempts to make you feel special and proud that you’re part of an elite group. If nothing else, you may congratulate yourself on having done such a good job of self-promotion to have earned that Most Viewed status. I actually saw a few “high fives” and “pure awesomeness” self-congratulatory notes posted on Twitter®. But the real beauty is that LinkedIn encourages those that have reached this milestone to share and spread the news with others. Sort of the way that Facebook® encourages their users to “Like”® postings, companies and products. “A stat this delightful deserves to be shared,” says LinkedIn. While LinkedIn may “humbly” tell us that they appreciate our help in reaching their 200 million members milestone, in the next breath they’re asking us to spread the word to others. And in so doing, LinkedIn is turning all of us into brand ambassadors, and encouraging all those others who didn’t achieve that Most Viewed designation to try to build up their profile views so they also achieve elite status next time around. Upgrade to a premium service. In short, use LinkedIn more. And in turn, more usage increases their legitimacy and perceived value and gives them more to brag about in press releases, annual or quarterly reports, and so on. 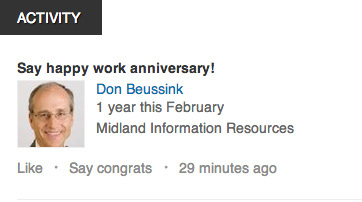 And if that’s not enough, LinkedIn now has another kooky badge – “Say happy work anniversary!” Say what? When I signed into my LinkedIn account today, up popped a message advising that one of my contacts had reached his one year work anniversary. LinkedIn had tracked his start date, and on his anniversary month, pushed that info out to all his contacts in much the same way that Facebook does with birthdays – and here’s the important part — encouraged all of us to congratulate him. The goal? More views of his profile, more people using LinkedIn as a social networking tool. And so round and round it goes. 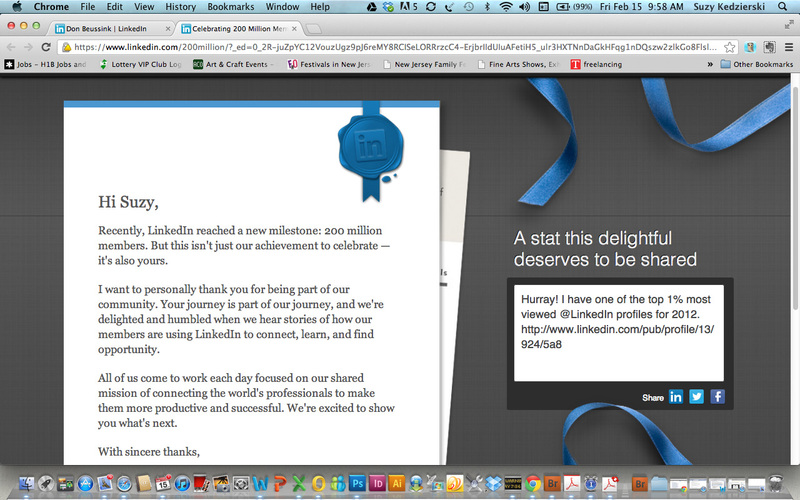 So, a big round of applause to LinkedIn’s marketing team for this very clever campaign. My initial response of maybe it’s a scam, that morphed into “so what, big deal,” has now turned into admiration for a really smart word of mouth marketing program to drive usage, engagement and loyalty, perhaps add premium services, and at the end of the day, add to the company’s bottom line. For more of my marketing-related blogs click this link or see the Marketing tab at left. For job seekers interested in tips and tricks for using LinkedIn, I’ve posted several articles in the Job and Career Advice tab. Facebook® and Like are registered trademarks of Facebook Inc.
LinkedIn® is a registered trademark of LinkedIn Corporation in the United States and/or other countries. Don Beussink is Director of Business Development at Midland Information Resources, a digital print media firm providing short-run, on-demand printing as a money-saving alternative to traditional print runs. With print facilities located around the globe, they can deliver quickly and economically, anytime, anywhere utilizing a media management library concept. 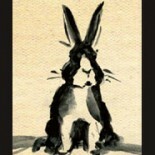 I receive no compensation from Don or Midland Information Resources, but am happy to highlight the profile of a friend. I likewise receive no compensation from LinkedIn, Facebook or Twitter. And about me… I am a B2B marketing communications specialist, job seeker, freelance writer and marketing consultant. Learn more at about me or see www.Linkedin.com/in/suzykedzierski. Great post Suzy! I’m taking a class at the UofT and we discussed this last time. I agree it makes you feel good about your profile and encourages you to keep building your profile. Cheers! Pingback: Give people a reason to celebrate | Andy Sernovitz | Damn, I Wish I'd Thought of That! Hi John – SO exciting to see you include my blog in your Sunday Musings article round up. And to be listed in the same group with articles by Mashable.com, copybloger.com and CNET.com — well all I have to say is, you’ve made my day. Make that my week! Many thanks. This entry was posted on February 15, 2013 by Suzy Kedzierski in Business, Marketing and tagged brand ambassador, Facebook, Linked In, LinkedIn, LinkedIn Most Viewed Profile, marketing, Social media, social media marketing, Word of mouth, Word of mouth marketing.